Frances Schultz will be interviewed at CALM’s annual Celebrity Author’s Luncheon, photo by Tiffany Evitts. Always one of our favorite literary and philanthropic events, the CALM Auxiliary‘s 30th Annual Celebrity Authors Luncheon on April 2 is a benefit for CALM’s (Child Abuse Listening Mediation) vital programs across the county that help prevent child abuse and treat children and families who have suffered from violence and abuse. This year’s event features interviews and book signings by a variety of critically acclaimed writers, including Meg Waite Clayton, Gregg Hurwitz, and Frances Schultz (featured on the cover of Santa Barbara Seasons‘ current spring 2016 issue). The event, which starts with book sales and signings at 10 a.m. at The Fess Parker – A Doubletree by Hilton Resort (633 E. Cabrillo Blvd. ), also includes a lunch (11:45 a.m.) and author interviews (12:45 p.m.) with Clayton, Hurwitz and Schultz. New York Times and USA Today bestseller Meg Waite Clayton is the author of five novels, including The Race for Paris and The Wednesday Sisters, one of Entertainment Weekly‘s 25 Essential Best Friend Novels of all time. Her first novel, The Language of Light, was a finalist for the Bellwether Prize for Socially Engaged Fiction (now the PEN/Bellwether). She’s written for the Los Angeles Times, The New York Times, The Washington Post, San Francisco Chronicle, Runner’s World and public radio, often on the subject of the particular challenges women face. Clayton’s new novel was 15 years in the making and inspired by real women journalists who defied military regulations and gender barriers to report on WWII. Meg Waite Clayton will be interviewed at CALM’s annual Celebrity Author’s Luncheon, courtesy photo. Gregg Hurwitz is the New York Times bestselling author of 15 thrillers, most recently, Orphan X. His novels have been shortlisted for numerous literary awards, graced top ten lists, and been translated into 26 languages. He is also a New York Times bestselling comic book writer, having penned stories for Marvel (Wolverine, Punisher) and DC (Batman, Penguin). Additionally, he’s written screenplays for or sold spec scripts to many of the major studios, and written, developed, and produced television for various networks. Frances Schultz, journalist, tastemaker, world traveler, hostess, Southerner, Sunday painter, and outdoors lover, is an enthusiast on decoration and design, food and entertaining, travel and style. She is author and co-author of several books, including The Bee Cottage Story—How I Made a Muddle of Things and Decorated My Way Back to Happiness. A contributing editor to House Beautiful magazine and former editor-at-large for Veranda, she has also written for The Wall Street Journal, Town & Country, Indagare and The New York Social Diary. She was the on-air host for six years of the award-winning cable television show Southern Living Presents and has appeared on The Today Show, The Nate Berkus Show, CNN’s Open House and many others. With husband Tom Dittmer, dog Stella, assorted horses and critters, she lives in the Santa Ynez Valley with visits to Manhattan and summers at Bee Cottage in East Hampton. Andrew Firestone is serving once again as Master of Ceremonies. Hank Phillippi Ryan, an interviewed author at last year’s luncheon, returns to the stage this year alongside Tom Weitzel, to interview the 2016 celebrity authors. Greg Hurwitz will be interviewed at CALM’s annual Celebrity Author’s Luncheon, courtesy photo. “The CALM Auxiliary is very proud to have hosted such a wonderful community event for 30 years. We have been so lucky to have had some of the greatest authors donate their time and talent, all the while supporting CALM’s important cause. The entire Auxiliary has been behind this project from the start and we couldn’t do our job without every one of them. We feel fortunate to be involved and are proud to help CALM in its mission to protect children and families from abuse,” say event co-chairs Becky Cohn and Carolyn Gillio. For tickets and event information, please call 805/969-5590 or click here. All ticket proceeds and a percentage of book sales will benefit CALM, the only nonprofit in Santa Barbara County focused solely on preventing and treating child abuse. CALM was founded in 1970 to reach stressed parents before they hurt their children. CALM continues to be the only nonprofit agency in Santa Barbara County focusing solely on preventing, assessing, and treating child abuse and family violence through comprehensive, cutting-edge programs. CALM offers children, families, and adults a safe, non-judgmental, caring, and strength-based environment to heal and increase family well-being. For more information about all of CALM’s services, please call 805/965-2376 or visit www.calm4kids.org. Originally published in Santa Barbara Seasons Magazine on March 22, 2016. Posted in Articles, Blog Posts, Books, family, Human Interest News, Nonprofits	| Tagged 30th Annual Celebrity Authors Luncheon, Andrew Firestone, Becky Cohn, Brussels to Beirut to Bali: The 1958 World Travels of Four Girls in a Second-Hand Chevy, CALM, CALM Auxiliary, CALM Auxiliary’s 30th Annual Celebrity Authors Luncheon, Carolyn Gillio, Child Abuse Listening Mediation, Chris Messner, Cuba Open From the Inside, Dana Kent, Ernie Witham, Frances Schultz, Gregg Hurwitz, Hank Phillippi Ryan, Jane Coleman, Jeff Farrell, Leslie Dinaberg, Lisa Guadagno, Lydia Edwards, M.L. VanBlaricum, Margarita Fairbanks, Meg Waite Clayton, Melissa Broughton, My Olympic Story Rome 1960, Odyssey of Innocents, Orphan X, Peggy O’Toole, Reflections in a Boomer’s Eye, The Bee Cottage Story: How I Made a Muddle of Things and Decorated My Way Back to Happiness, The Fess Parker: A DoubleTree by Hilton Resort, The Grace of Crows, The Language of Light, The Love Bunny, The Lucky Ones, The Race for Paris, The Wednesday Sisters, Then I Won’t Seem So Far Away, Tom Weitzel, Tracy Shawn, Valentino, Where Are Pat and Ernie Now? Foodbank of Santa Barbara County’s 3rd Annual Fork & Cork Classic takes place on April 10 at Santa Barbara Polo and Racquet Club. Photos by Eric Roland. I love it when good causes and good food and wine come together. Such is the case with the 3rd annual Fork & Cork Classic to benefit Santa Barbara County Foodbank by pairing gourmet tastings with local wine to fund nutritious meals for Santa Barbara County residents. Taking place on Sunday, April 10, from 3-6 p.m. at Santa Barbara Polo & Racquet Club (3375 Foothill Rd., Carpinteria), 100% of the event’s proceeds will benefit the Foodbank’s 300 local nonprofit partners who supply nutritious meals to Santa Barbara County residents. Just last year, the Foodbank served 146,198 people, of whom 51,533 were children. This year the Fork & Cork Classic 2016 will honor Dario Furlati, chef-owner at Ca’ Dario Ristorante and Ca’ Dario Pizzeria; Steve Beckman, winemaker at Beckman Vineyards, and Jack Motter and Jeff Kramer, farmers-owners at Ellwood Canyon Farms, for the contributions they have made towards advancing their respective crafts as well as their efforts to support the local community, including the Foodbank. Participating wineries and other beverage donors from previous years include Alma Rosa Winery & Vineyards, Ampelos Cellars, Ascendant Spirits, Beckmen Vineyards, Blair Fox Vineyards, Caribbean Coffee Company, Casa Dumetz Wines, Cutler´s Artisan Spirits, Consilience, Marianello & Tre Anelli, CORE Family Winery, Deep Sea by Conway Family Wines, DV8 Cellars, Falcone Family Vineyards, Fess Parker Winery & Vineyard, Foley Wine Estates, Island Brewing Company, Jaffurs Wine Cellars, Kaena Wine Company and Kenneth Volk Vineyards. Also pouring in the past were Lucas & Lewellen Vineyards, Nagy Wines , Pegasus Estate Winery , Scott Cellars, Silver Wines LLC, Summerland Winery, Pressed Juicery , Turiya Wines, The Real McCoy Rum, Tito’s Handmade Vodka, Water Store, William James Cellars, Whitcraft Winery and Zaca Mesa Winery & Vineyards. 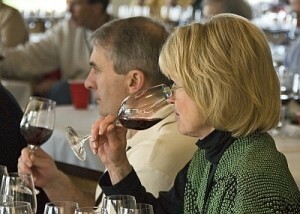 For an updated list of food and beverage participants visit forkandcorkclassic.org. General Admission tickets are $95 and VIP tickets—which include early entrance to the event at 2:30 p.m. and a VIP lounge—are $125. To purchase tickets click here. I hope to see some of you at this fun—and very worthy—event. Cheers! Click here for more cocktail corner columns. This story originally appeared in Santa Barbara Seasons Magazine on March 18, 2016. Photograph by Patricia Houghton Clarke. At first glance, it is unclear if you’re viewing an impressionist painting or simply a captivating reflection, which is exactly what drew Patricia Houghton Clarke to take this intriguing photograph. Clarke was wandering along a path at Arroyo Hondo Preserve, on her way to the birthday party of Phil McKenna, a longtime friend and one of the founders of Naples Coalition and Gaviota Coast Conservancy. The reflections caught her eye as she was standing in the middle of the creek, recalling a conversation about the preservation efforts with J.J. Hollister, whose family once owned the 782-acre Arroyo Hondo—sometimes called “Jewel of the Gaviota Coast”—and later sold it to Land Trust for Santa Barbara County, which now runs the preserve. Incidentally, McKenna is the only person with a print of this image, part of Clarke’s “Unseen Santa Barbara” series. One of the things I love about the photo,” she says, “is that you really can’t tell what it is unless you look into that lower right hand corner and see a little stone in the water, so there’s a little giveaway of what it is. For more info about Arroyo Hondo Preserve and the steelhead trout preservation efforts, visit sblandtrust.org. For more information about Patricia Houghton Clarke and her work, visit patriciahoughtonclarke.com. This story was originally published in the Spring 2016 issue of Santa Barbara Seasons Magazine. Just in time for our wine-themed issue is one of my all-time favorite wine festivals. The 16th Annual World of Pinot Noir (Mar. 4–5) brings together an impressive lineup of producers from the most exceptional and unique regions in the world with pinot noir enthusiasts for a weekend of celebration and education at the beautiful Bacara Resort & Spa. This year’s event includes two days of food and wine extravaganzas hosted by an outstanding panel of sommeliers from across the U.S.
For more information visit worldofpinotnoir.com. Originally appeared in the Spring 2016 issue of Santa Barbara Seasons Magazine. The Pullman Room at The Lark, photo by Rob Stark. Cultivate Events (CE), The Santa Barbara Fermentation Festival (SBFF) and Soho Restaurant & Music Club (Soho) host their first annual Wild Brew Fest on Mar. 6. The event is at Soho, 1221 State St., from 3-6 p.m.
Wild Brew Fest serves various traditionally brewed and fermented alcoholic beverages including spirits, beer, cider, mead and wine. Visitors can enjoy these drinks en plein air with snacks featuring the freshest and finest food of the county. Wild Brew Fest also features do-it-yourself stations such as a pickle station where guests can learn the art of fermentation, courtesy of the Pacific Pickle Works and Pure Order Brewing Company, and Valley Brewers‘ home-brew station. For information and tickets visit wildbrewfest.nightout.com. Give your taste buds a thrill at the 2016 Buellton Wine and Chili Festival where over 20 chili/salsa chefs and 30 wineries will compete! Come and see these amazing individuals battle it out to win prizes such as the Best Red Chili, Chili Verde, and Homemade Salsa. And have your say with the People’s Choice Awards for both wine and chili categories. Ticket price includes a souvenir wine glass, unlimited tastings, and live music. Make it a family event and spend the day eating good food and playing games like horse shoes, table tennis, and bocce ball. Bonus: children under 12 get in for free! The event takes place from noon to 4 p.m. at Flying Flags RV Resort, 180 Avenue of the Flags, Buellton. If transportation is a concern, take the Brew Bus from Santa Barbara for $25. Leaves at 10:15 a.m. from Figueroa Mountain Brewery, 137 Anacapa St.) and brings you back at the end of the festival. Presqu’ile Winery hosts its first annual Presqu’ile Tri-Tip Cook-Off, featuring a stellar lineup of top-ten local culinary talents, including Chef Nick Barainca, the Auten Boys and more. Manning the grills in our beautiful al fresco setting, each will prepare their own inspired take on tri-tip for our guests and a panel of distinguished culinary judges. To purchase tickets, contact Estates Manager Cameron Porter at (805) 937-8110 ext. 103 or cameron@presquilewine.com. In its 24th year, Taste of Solvang is a fabulous destination for food and wine lovers alike. Some of the highlights include the Taste of Solvang Blind Tasting Challenge on March 17 at 6 p.m. at Wandering Dog Wine Bar, where guests will challenge their palates while learning more about wine as they match up varietals, regions, alcohol percentage, vintage and price points. Tastings will include four half-glasses of red wine and cheese pairings. Saturday, March 19 brings the Solvang “Tasting Trail” (various locations, 11 a.m.–4 p.m.), where guests will sample and shop their way through Solvang as dozens of food businesses welcome Tasting Trail guests with edible treats. The Tasting Trail will overlap with this year’s Wine & Beer Walk, (various locations, Saturday 2–7 p.m. and Sunday 12–4 p.m.) so attendees may simultaneously take part in both food and drink activities. The Wine & Beer Walk features 15+ wine & beer tasting spots, and is a great way to discover new favorites, and sample local, boutique wines and craft beers as you work up a hunger for more Taste of Solvang happenings. Courtesy Wandering Dog Wine Bar. The Lark Executive Chef Jason Paluska teams with Brian Thompson of Telegraph Brewing Company for an exceptional tasting menu of seasonal and locally sourced products designed to complement the acclaimed brewery’s signature beers and ales. Thompson, Founder and Brewmaster of Telegraph will be on hand to describe how adjustments in process and recipe manifest themselves in the beer’s flavor profiles. Telegraph Brewing Company is the recipient of numerous Gold, Silver and Bronze awards from the Great American Beer Festival and the Beer World Cup. The dinner begins with Steelhead Ocean Trout Crudo with Thai Chile & Avocado Mousse, Hearts of Palm, Pickled Kumquat and Candied Coriander Seed paired with Telegraph White Ale; followed by Grilled Delta Asparagus with Bone Marrow Hollandaise, Meyer Lemon Peel, Crispy Sunchokes and Nasturtium paired with Telegraph California Ale. The main course is Paluska’s succulent Roasted Pork Belly Porchetta with Creamy Hominy, Red Cabbage, Escabeche Pickled Vegetables, Crispy Pig Ears, Preserved Lime and Oregano paired with Telegraph Los Padres Saison. Completing the dinner is a dessert of Seared Hudson Valley Foie Gras & Warm Donuts with Hibiscus Caramel and Duck Fat Pecans, created by Executive Pastry Chef Jeff Haines and paired with Telegraph Reserve Wheat with Hibiscus. Served in The Lark’s private Pullman Room (pictured), pricing for “Local Treasures” with Telegraph Brewing Company is $111 per person, all inclusive of taxes and service charge. Tickets may be purchased by calling The Lark at 805.284.0370 or visit Local Treasures at The Lark. Seating is limited. The Lark is located at 131 Anacapa St. in the Funk Zone. Steve and Crystal Clifton, courtesy photo. Another delicious event in Funk Zone is Les Marchands and Palmina Wines celebration of Spring with a five course paired dinner and an intimate evening with Palmina’s Steve and Crystal Clifton. For more than 20 years the pair has produced compelling, food friendly wines that showcase the tremendous versatility the Santa Barbara County wine growing region has to offer. Add Chef Weston Richards into the equation and you get an exquisite five-course menu to compliment and showcase the depth and brilliance of the Palmina line-up! Chef Weston’s menu will be revealed later this week, but reservations are now being taken. The cost is $99, excluding tax and gratuity, and seating is limited. To purchase tickets and reserve your seats, email dan@lesmarchandswine.com. Les Marchands Wine Bar & Merchant is located at 131 Anacapa St., Suite B. in the Funk Zone. Originally published in Santa Barbara Seasons Magazine on March 4, 2016. Sarah Koenig and Julie Snyder, courtesy photo. Conan O’Brien, The Conan Gallery // Siren Studios Orange, Los Angeles, CA. David Sedaris, photo by Hugh Hamrick. UCSB Arts & Lectures has a fabulous lineup of speakers this year, including one of comedy’s most original and beloved personalities, Conan O’Brien (Apr. 16); Serial’s visionaries Sarah Koenig and Julie Snyder, who speak about creating what has quickly become the most popular podcast in the world (Mar. 3); perennial favorite humorist and author David Sedaris (May 1); and Temple Grandin Ph.D. (May 10), one of the world’s 100 most influential people, according to TIME, a best-selling author and the world’s most well-known adult with autism. For tickets or more information visit artsandlectures.sa.ucsb.edu. Originally published in the Spring 2016 issue of Santa Barbara Seasons Magazine.